Hi all. I'm honored and delighted that James Swan has invited me to be a contributor here on Beggars All. Some of you may remember me from the old NTRMin discussion board. That's where I first met James Swan, as one of the adelphoi -- Eric Svendsen created a wonderful community there, and I am very grateful to have made some long-term, lasting friendships there. I'm a former Catholic -- I was born in 1960 and raised in the Catholic Church by a devout family. But by the time I was in high school, I had also heard the Gospel from some friends -- and I just could not comprehend why this "Gospel" was not what "the one true Church" was teaching, especially not if it was in the Bible. Needless to say, it created a great deal of turmoil in my spirit, and it set off a struggle that would consume me for a long time. In fact, that question -- an overwhelming desire to find "the reason why," motivates me today. My story is here. But the issues I investigated in leaving Roman Catholicism continued to tug at my heart and mind. How could such a big, authoritative and seemingly wonderful thing have gone so wrong? My final break with Rome came in the late 1990's, thanks largely to the writings of James White, available for the first time on a broad scale via the Internet. It is said that the Reformation owes its tremendous influence to the invention of the printing press, and the ability to disseminate information far and wide in a very short period of time. I believe the Internet has created a similar opportunity for believers today. During the 16th century, the message of the Reformation spread far and wide, because it was the message that people craved to hear. Rome didn't stop the path of the Reformation by presenting better ideas or a better gospel. They stopped the march of the Reformation with lies and trickery, with the burning of books, threats of imprisonment, such deceit and murder as that found in the St. Bartholemew's Day Massacre. In 1543 a little book was published in Venice with the title Trattato utilissimo del beneficio di Giesu Christo crocifisso i cristiani (A Most Useful Treatise on the Merits of Jesus Christ Crucified for Christians), written by an elusive Benedictine monk called Benedetto da Mantova with some help from the humanist and poet Marcantonio Flaminio (1498-1550), a popular work of piety that was translated into several languages including Croat. At first sight this may appear to be a piece of native Italian Christocentrism, part of a Pauline and Augustinian renaissance known to have been nourished by a Spanish humanist and biblicist, Juan de Valdes (1500-1541), whose pious circle in Naples had included Flaminio. But the Beneficio can be read in more than one way. It proves to have been made up from a number of transalpine Protestant texts, and especially the 1539 edition of Calvin’s Institutes. Whether or not Benedetto had come across Calvin in his monastery on the slopes of Mount Etna, which seems unlikely, the Institutes was known to Flaminio. I'm not a theologian, but as the old Abraham Lincoln commercial said, "I've done a lot of reading and studying, sort of on my own." My interests continue to lie in areas that describe "reasons why": Reasons why the Reformation needed to occur; reasons why "the Church" had gotten so far off the rails in the first place. The Reformation and "The One True Church"
Newman's Theory of Development "Shattered"
I'm grateful to James Swan for the opportunity to share what I've learned about the history of the one true church, the "development" of the Roman Catholic Church," and the need for the Reformation, in the 16th century and today. I'm grateful for this opportunity to become a part of the "Beggars All" community, and I'm looking forward to opportunities to share in the ongoing efforts of the Reformation today. It's funny, a few months back I was going to suggest to James that he invite you to join the blog. I have enjoyed your writing. "Welcome" in Farsi = transliteration = "Khosh Amadeed!" I always enjoy your comments and writings and see I need to read more of your material - but alas, I cannot keep up with Turretinfan's excellent scholarly papers he cranks out almost every day, sometimes more than one, and all the good and meaty material over at Triablogue either, Steve Hays and Jason Engwer and others! I am overwhelmed with a great library of information! Welcome, brother. It will be good to see you on here. Nice. And Swan hits one out of the park in this draft. Alan, you're too kind, and maybe a bit crazy. Glad to see you here. I will look forward to reading and following your discussions!! It's great to see you as a contributor here! It's been a long time! What cliche should I use... the rich get richer. I think that no good can come out of your invitation here. I respect James Swan, but I think this time he made a big mistake. Yeah, come to think of it, I rescind my earlier welcome. I submit myself to the Awesome Power of Lvka's Naked and Bizarre Assertions. Let them bowl you over. Let them wash over your mind. You'll be a better man for it. Lvka, thank you for your comment. You really have made my day. I'm not upset at all. It's good to be insulted right out of the block. John, I would only be concerned if Lvka had applauded your invitation. Ken, I would like to talk to you about some stuff. We met at a Perspectives class a while back. My name is Daniel Server and I can be reached at Blessed2BABlessing@Gmail.com. Please send me an email. I'm here in the Atlana area. *If anyone else can help me get in touch with Ken* please send me an email with his email address. Thanks! Oh, I thought that Swan was against conversion stories? Alexander, I didn't publish this to be a "conversion story," but just to give the Protestant folks here an idea of where I'm coming from. I'm not a big name conversion and I don't expect the fact that I used to be Catholic to impress anyone. But we do have this little tradition of giving a testimony, and I'm going to try to be as transparent as possible here. I have to question your use of the word "hatred." Can you provide any specific examples? Oh, I thought that Alexander was against irrational and irrelevant comments? "Introducing myself ... John Bugay"
I like the 12-step introduction. It goes something like, "Hi, I'm Ted, and I'm an alcoholic...."
Then we could have, "Hi, I'm John, and I'm a former Catholic...."
And being a co-blogger on Beggars All is like step 11 or 12 on the recovery process. Hi Truth ... I didn't intend that. Although it is incredibly hard to leave Catholicism. It sinks deep roots into you, culturally if not in the sense of it being a religious faith. Because, if you have a family, especially (and not just your nuclear family, but your extended family), you still have to go to weddings and funerals and baptisms and watch the nieces and nephews go through their first communions, etc. A friend of mine once said he wanted to write a book about dealing with family members after you leave the RCC. It is genuinely awkward in a lot of cases, and there are times when you just never really know how to act. I know, John. I was just teasing you. But you made a great point. Ref500 is one of my favorite blogs. "I don't want this nice little Luther-friendly Reformed/Calvinist oasis to turn into the next "Triablogue" or something..."
Lvka, I'm a very Luther-friendly Reformed/Calvinist. Believe it or not, I love Christ and his church. If you sense "poison," consider that I'm frequently only reporting on church history. The poison is coming from those things and events. But sunshine is the best medicine. Andrew: Ref500 is one of my favorite blogs. Well, Andrew Suttles is one of my favorite Puritans! Well, James Swan is clearly a formidable talent scout. Is that why you keep traveling over there to violate your ban? You're too much, Lvka. I look forward to reading your contributions, John. Hi all, John sent word he was invited to contribute here and I wanted to come and congratulate him. He is an old friend from Eric Svendsen's NTRMIN board, and a wonderful writer. Hi John! If I may ask what demonination do you attend? Thanks. Andrew -- I look forward to reading your contributions, John. Thanks, Andrew, I'm delighted to be here. My3sons -- I'm a member of a PCA Church. Half of the battle is finding these guys before Triablogue does. That blog tends to function a bit like the Yankees in acquiring players. Don't feel insulted. I'm honestly afraid of the possible negative influence your presence here might bring. Hmmm … negative influence … makes you wonder if Lyvka gave his posts much thought. Physician heal thyself or remove the plank from your eye. Hey Ronnie, moving him from "no good" [at all] to "negative influence" in the space of a few hours? That seems to be some real progress! Yeah! I guess he is making process. Oh, and don't forget he is "sorry" if it upsets you, but heck that is what he "believes" so get over it. However, "don't feel insulted" because he really is "sorry" and he really "believes" it. I was wondering if there was one concept of RC that put you over the edge of converting? As one who is really trying to look at the issues, and open to converting to Orthodoxy or RC...your story interests me greatly. As far as what issues, the biggest was justification by faith alone, and the concept of imputed righteousness, vs. "an infusion of grace and then we work to make our own righteousness." I walked out of confession with a priest over that discussion. But before finally making the break, I made sure to respond to every single objection either that I might have had, or that others suggested I should have. ("You can't go, Protestants needed to rely on Church authority for their canon," or "We've got the only valid apostolic succession.") Those were the big ones for me. Ultimately, I decided not to go beyond what is written; that is, to check everything against Scripture. It's true, the Roman Catholic Church has an answer for everything. But I just came to distrust those answers, because they, in large part, tended to discount the Scriptures. I disliked that very much. Lip service is paid to, "we have the highest regard for Scripture," but saying, "we alone have the correct interpretation" puts "Church" above Scriptures in practice, and I could not find Scriptural warrant for that. What is it about my story that interests you? My interest is selfish really. I know you only through a few posts that I have read here and now at your blog. I am starting to research the history of the Church via RC, Orthodox, Protestant, etc...and wrestle with the charge that Luther brought brand new concepts of justification to the fore, specifically the imputation of Christ's righteousness to the believer. It appears that "faith alone", at least some concept of it, was taught even early on...but the imputation of Christ a new concept in the 15/16th century. This does bother me. When reading Romans and the NT...I at this point see nothing but faith alone through Christ alone, but am trying to understand the RC/Orthodox understanding of it, with an openmind. So, I am interested in your story since it deals with my own situation of seeking truth. Well, John, what can I say? You're a loose canon. My advice to you? Same as Chuck Berry's. -- I just hold my fingers crossed, hope for the best, and prepare for the worse. But sunshine is the best medicine. Half of the battle is finding these guys before Triablogue does. Triablogue: "Luke Skywalker, join the dark side!" Welcome, brother! I am in great anticipation of reading your witty and cogent articles on the faith, just as I have enjoyed your combox comments in the past. And congratulations on being insulted by Lvka right out of the gate! It gives me reason to hope and rejoice in the high expectation of the insultee's ability to be of great service here in clearly articulating the true gospel of our Lord Christ. Joe, there was an earlier thread around here -- I think it was the Zwingli thread -- in which the concept of justification by faith in the early church was discussed. I'm listening to some lectures through RTS's iTunesU program right now -- "The Letters of Paul" -- and they're digging into the original Greek, and it's hard to imagine that human effort has anything at all to do with what Paul's talking about. It seems certain that Justification by Faith exists in 1 Clement and also Hilary of Poitier's commentary on Matthew. The only commentary on Romans that I'm aware of that's written by a Catholic is Joseph Fitzmyer's. I haven't read that, but I understand that he comes very close to the Protestant understanding of that work. (I have commentaries by Douglas Moo and Thomas Schreiner on Romans, as well as a copy of Luther's commentary). If you are aware of any Catholic commentaries that support the doctrines articulated in the CCC, I'd be interested in seeing how they do that. One thing that I came to understand early on in this search of mine was that there is so much information to have to consume and understand, that it was vitally important for me to have sources that I could trust. And Catholic sources seemed largely unreliable to me -- for all of the boasting about the Magisterium having the correct interpretaion, that "interpretation" more often than not when dealing with Scriptures tended toward obfuscation than clarity. Nice to see John on the blog (Ali...I see you...:waves:). It was nice being part of the adelphoi over at NTRM. Sadly, I've noticed that Eric's blog has come down. It must have happened within the last two weeks, considering I still check in every other week. Even though Eric hadn't posted in quite some time, I really appreciated his ministry and his scholarship. His website was a goldmine of information. I guess his blog will live on in the internet archives. And congratulations on being insulted by Lvka right out of the gate! do you have a persecution complex? My descriptive statement regarding your insult of John Bugay is above reproach and is no reflection upon my mental state whatsoever. Thanks for the link. Yea, imputation is certainly how I understand Romans/NT at this point...and 1 Cor 5:21 is a great verse giving evidence for this view. I know John Piper uses it in his book, "Counted Righteous in Christ" which I am reading right now. My wrestling is not that the scriptures teach it (at this point), but that nobody before Luther taught it. It begs the question to myself of how can something that I think is so clear, be missed for the majority of the life of the Church. It seems faith alone was taught much earlier, but not the idea of imputation...which I at this point cannot understand one without the other. DavidW has given me a few things to read. Would you recommend Moo's commentary? Hi Joe -- Thanks for the links. I would definitely recommend Moo. I have read only small portions of it to date, but I'm listening to "The Letters of Paul," by Knox Chamblin, through iTunes.rts.edu and there are a number of lectures in there about Romans. He digs into the Greek to a good extent, and it's fascinating plumb all the depths of this incredible letter. I'd recommend it if you get a chance. Thanks, too, for the links. I do recall having seen the Aquinas piece somewhere. I'll give those a look. As far as justification, "that nobody before Luther taught it," it was taught in different forms. "Justification by faith" is mentioned in 1 Clement, although as was discussed, T.F. Torrance has argued that Clement's view of grace, which would necessarily be an underpinning to that, had gotten away from Paul's understanding of grace, to some degree. I think there's more of a need to study that in detail. Hilary of Poitiers, who wrote a commentary on Matthew in the mid 4th century, seems to have a very fine understanding of justification by faith. He was a scholar and a bishop, and he was known as "the western Athanasius," I believe. Augustine wrote extensively about such issues, though, not knowing Greek and Hebrew, what he wrote was not totally biblically accurate. And that was a problem, because most of the rest of the Western church, anyway, picked up his usage. My thought is just that God will not hold anyone's feet to the fire for not having held to the precise theological articulation of one particular doctrine or another. What he asks for is that they turn to Him in faith in Christ. 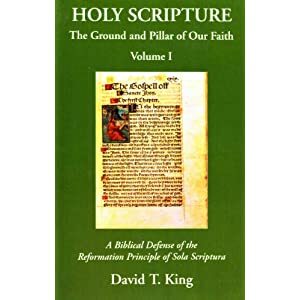 But it's another thing for an official body, such as the RCC, to have articulated a doctrine of justification that really is unscriptural, and to have bound the consciences of its people to that unscriptural doctrine. That, I think, is seriously objectionable. Thanks again for those links, I'll definitely give them a look. I think we have different definitions of "insult". (It's not like I cursed the man... I just sincerely expressed my reluctance that his being invited here is beneficial for this blog, that's all). You're probably right. Why on earth should I think "You're not worthy to be posting on this blog" is an insult? You crack me up, guy. It's not that he's not "worthy".. he's a loose canon.. In any case, I said the truth, and I *HATE* apologizing for stating the truth. Of course, that kind of thing, "he's a loose cannon" (whatever that means), is subjective, so I'm not sure how objective truth figures into the equation. I'm not privy to your history with John, so I shouldn't comment further on that. Nevertheless, no worries, mate. Didn't mean to hound you about it. I consider the matter closed. Care to explain just precisely how this is so? Churchmouse: Sorry I missed your comment, which got lost in a flood of other things. It's great to see you here. I too appreciated Eric's ministry. James Swan gave me the link to the archives of the old discussion board. I think there are even some sermons there. Well there's a good idea-if your friend doesn't do it, maybe I should. "A friend of mine once said he wanted to write a book about dealing with family members after you leave the RCC. It is genuinely awkward in a lot of cases, and there are times when you just never really know how to act.